Monitor your teams productivity wherever they are. 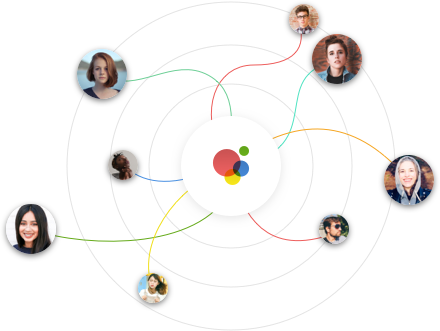 Bring inhouse or remote teams closer together by monitoring their activity across multiple projects in real time. Key to meeting project, and business, goals is knowing when to reorganize your team and redistribute tasks to move as fast and efficiently as possible. 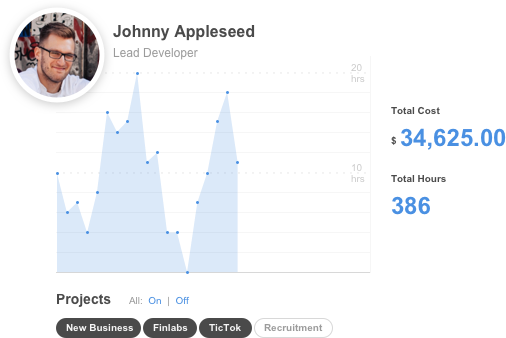 Simply add your company projects and start inviting the employees you need to log time against them. Manage your project team to control access and only receive time from the people that matter at any given time. Even assign individual rates to connected employees to generate billing estimates and give you a clearer idea of what your projects should be generating for your business. Calenders full of meetings and project management boards full of tasks don’t always match reality. The TicTok App allows you to track as you go by asking you to log what you have just been doing. This means every deviation has happened, and can easily be recorded while fresh in your short-term memory. Connect to your team, wherever they are. By inviting employees into your projects it is irrelevant where they are physically located. TicTok brings all of your employee activity all together into one helpful view. This means whether they are sitting right beside you or halfway around the world, they are only a click away. It's important to know the effort and amount of time dedicated to tasks in order to put a financial value to it. TicTok allows you to assign rates to projects or tasks to accumulate a total financial impact that you can use to better distribute effort or bill clients. Look at your employees individually to understand how many projects they are working on, where their time is being utilized the most, and how they are performing in general. We can apply time to tasks, but does that mean the task will take that long? TicTok for businesses allows you to invite in TicTok app users and gives you a real-time view of who is doing what, and when. Keep projects moving faster by seeing when individuals overperform allowing you to offset tasks that are underestimated. 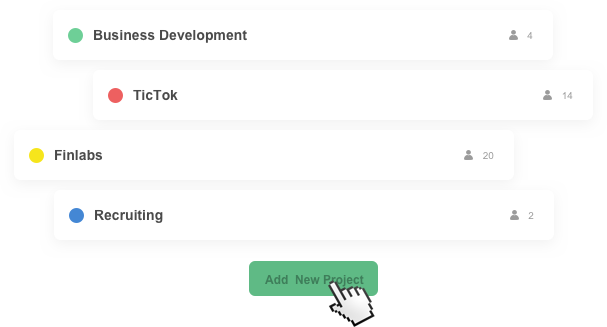 As every connected employee logs or edits time to your projects it will appear in TicTok Business Manager. With this information at your fingertips, you can easily monitor progress and see where you need to distribute resources to keep your projects moving as efficiently as possible. Project and employee information can all be exported as a .csv file from within TicTok Manager so you can plug it into any compatible application. Connections to employees can be controlled. Individual employees only access projects relevant to them, for as long as you define. Editing time by employees is also controlled so you can be confident about your historical information. Set a global rate for each employee to build a default rate card. Customize any specific rate on a project to overide the default and keep your information on track. We initially build TicTok to help us track our own progress on client projects. We quickly realized its benefit in helping us meet our goals and targets as a business. Now we're excited to make it available to businesses everywhere. We initially started using TicTok to help track our progress on client projects. We quickly realized that it was also going to help us manage our projects as they happen and better meet our goals and targets as a business. TicTok was created by a small team of enthusiasts from Finlabs. Finlabs is a friendly bunch of experts driven by success. Not just our own success, but the success of our clients. At Finlabs we love challenges large and small and will bend over backward to help anyone with anything from rolling around a whacky idea to figuring out the intricacies of your next great product and service. © 2019 Finlabs Oy. All rights reserved.